I already blogged about my visits to Göbekli Tepe in southeastern Turkey. It’s an important site from the Early (preceramic) Neolithicum. What it is, we don’t really know, although Klaus Schmidt, the excavator, is pretty sure that the site is religious in nature. 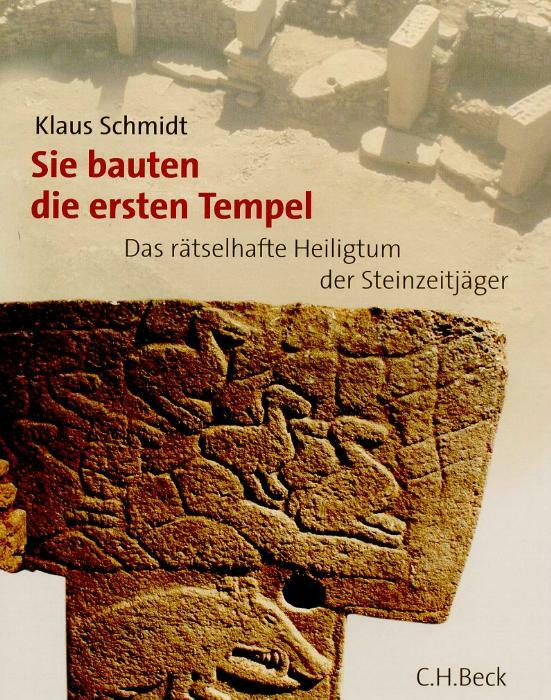 In his nice, well-illustrated book, Sie bauten die ersten Tempel (“They built the first sanctuary”), he offers lots of information. The book is very well-structured. In the first chapter, Schmidt explains how the site was identified. It had already been discovered, but the discoverer had not understood that the big stones on the surface were from the Stone Age. Misidentifying them as Islamic tombstones, he had not realized the site’s significance. Schmidt, who had the benefit of knowing the finds from sites like Çatal Höyük, Çayönü, Nevali Çori, and Gürcütepe, was the first to realize the importance of Göbekli Tepe (“belly hill”). The second chapter is about the discovery of the Stone Age, from the very moment that archaeologists realized that there had been an age in which people made stone objects, until the present day. It is a very useful and interesting chapter, because Schmidt can introduce important questions and technical expressions. The third, and longest, chapter consists of a meticulous description of what has actually been found. The five enclosures are mentioned and every pylon receives is dealth with. Those pylons, which represent human figures (ancestors? ), were decorated with all kinds of animal figures. Perhaps this chapter was a bit too detailed, but Schmidt did well to separate the description from the identification. The fourth chapter deals with the interpretations. Schmidt compares Göbekli Tepe to several other places, without making very strong statements. Nevertheless, I was impressed by his argument that at least one picture does not represent ostriches, but people dancing like ostriches. I also liked the idea that the pictures of animals might in fact be some kind of sign language, although Schmidt does not say that this is the only possible interpretation of the finds. His conclusion is essentially negative: he is certain that these animals were not representation of the hunter’s prey. No one hopes to catch spiders or snakes. In the fifth chapter, we read about the way this monument was built. A great many hunters and gatherers must have been involved, and the size of the monument proves that they were well-organized. The 2007 edition of the book, which was first published in 2005, concludes with an additional chapter with new finds and further thoughts. What I like about Sie bauten die ersten Tempel is that it presents scholarship as a puzzle and allows readers to understand the process of acquiring knowledge. There is much room for doubt and cul-de-sacs are not ignored. For example, many animals look as if they are about to attack – but what are they defending? Schmidt admits that he does not know. He calls the building a temple, but immediately stresses that in fact, we cannot really know. This is the way a true scholar must proceed. I like this excellent book and can sincerely recommend it. There used to be a time when the universities were well-respected. People who had gone there, were believed to be wise and impartial. If they said X, we knew it was X and not Y. However, people have grown sceptical, and their scepticism is sometimes justified. Here in Holland, our government recently came up with a plan for a mass vaccination against Mexican flu; people just stayed away, and in the end, it turned out that the risks had been overestimated. Scepticism is, therefore, not wrong in itself, although I do not like this same scepticism when we’re discussing the changing climate. Many of the cities of modern Europe owe their location to choices made some 2,000 years ago during the time of the Roman Empire, new research from a University historian has revealed. New research? Really? To establish what everyone already knows and no one denies? I was tempted not to read any further, believing that it would be another nonsensical press release (compare, compare, compare, compare) and I am probably not the only one who was disappointed. I am afraid that this press release has done a lot damage, confirming the idea that scholars do a lot of silly, unnecessary work. The authors of this book are probably hard-working scholars, who did not write this press release. I am not blaming him. To make sure that this blog post, which is about PR, will not turn up in a Google search about them, I won’t mention their names. Nevertheless, if you want to check this story, it’s here.